Office Depot and OfficeMax are lucky to have each other. Uniting the U.S. purveyors of pens, paper clips and printer toner is about as obvious as it gets in M&A. The potential synergies could be worth more than the market value of the two companies combined. As the Internet ravishes retail, at least this corner can cling to life by merger. Consolidation is overdue. The encroaching power of the likes of Amazon and Target has been evident for years. Office Depot and OfficeMax are also good partners. Plenty of nearby stores could be closed and their own suppliers squeezed. Based on past deals, savings of about 2.6 percent of revenue, or some $450 million a year in this case, look realistic, Sanford Bernstein analysts wrote in a prescient note on Friday, ahead of weekend reports of the two companies being in talks. These cost cuts, taxed and capitalized, would be worth about $3 billion to shareholders. That’s an impressive sum given the two companies were only worth around $2.1 billion combined before the merger talks were reported. Investors initially added another $400 million on Tuesday as they anticipate details on a possible all-share combination. There will be questions about competition, of course. Trustbusters ordinarily take a dim view of two top players joining forces. In 1997, regulators scotched a $4 billion deal that would have united market leader Staples with Office Depot. Given the radically altered market dynamics 16 years later, however, it’s hard to see a merger between numbers two and three in sales as a powerful monopoly in the making. OfficeMax is on track to generate a net margin of just 0.9 percent in 2013, according to the average estimates of analysts collected by Thomson Reuters. 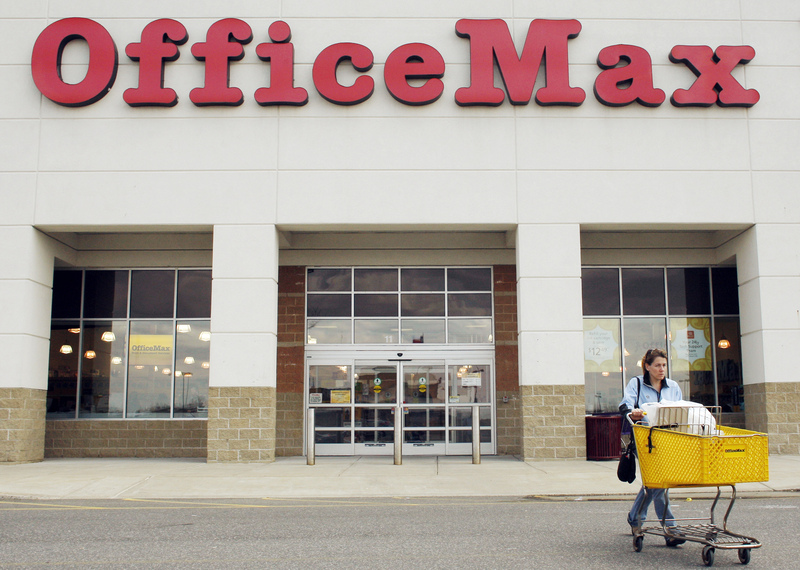 Office Depot is seen struggling to eke into positive territory. Revenue at the top three chains is forecast to stagnate, but online competition could be harsher as other specialty retailers like Blockbuster, Circuit City and Borders learned. While Offices Max and Depot might together slow the decline, their industry is still bound to die a death of a thousand paper cuts. A customer leaves an OfficeMax store in Everett, Massachusetts April 30, 2008. Office Depot, the second largest U.S. office supply retailer, is in advanced talks to merge with smaller rival OfficeMax and a deal could come as early as this week, a person familiar with the matter told Reuters in an article published on Feb. 19. The deal is expected to be structured as a stock-for-stock transaction, the person said. News of the talks had been reported earlier by the Wall Street Journal. Before the report, market leader Staples had a market value of $8.7 billion, against $1.1 billion for Office Depot and $930 million for Office Max. The Federal Trade Commission rejected a $4 billion merger of Office Depot and Staples in 1997, saying it would lead to less competition and higher prices for customers.